Water temperature anomalies in the Pacific Ocean are driving extreme warmth and precipitation over diverse parts of the United States. Graphic courtesy of NOAA. The oceans of the world have a huge impact on the weather. Water temperature anomalies in the Pacific Ocean can explain the recent record rains following years of drought in California, record high temperatures in Denver and Burlington, and the lack of snow in Chicago. With an unexpectedly weak La Niña following the recent powerful El Niño, anti-blobs in both the Pacific and Atlantic, and a rapidly warming arctic, climatologists are wondering: What’s next? Greenland’s glaciers are melting — there’s no dispute about that. But what is the effect on ocean water temperatures, air temperatures, and oceanic and atmospheric circulations? On the whole, the Earth is warming. But the warming is clearly not uniform, as there are feedback mechanisms. Decoded Science has noted the feedback of melting arctic sea ice on temperature. Ice is highly reflective; water is not. As arctic ice melts, less incoming radiation is reflected and more absorbed; global warming is amplified in the arctic. Near glaciers, there is an opposite feedback. The melting of a glacier creates a pool of cold, fresh water, which literally floats on the warmer, salty ocean and insulates the air from any warming effect of the sea. This feedback depends on a unique property of water: H2O, unlike almost every other substance, does not continually get denser as it gets colder. Water reaches a maximum density at 4° C (39° F). The temperature of a body of water can be warm above and colder below (down to 39° F), or cold above and warmer below (up to 39° F). This is the basis for the familiar ‘turning over’ of lakes and ponds twice a year in climates where surface water can fall below 39° F.
The effect of Greenland’s melting glaciers can be seen in the sea surface temperature anomaly map. Decoded Science has called the cold water near Greenland an anti-blob (we’ll discuss why in a little while). This seems to be part of a general pattern of cold water in the high latitudes of all the oceans, near land masses that contain glaciers. In contrast to colder waters in high latitudes, the water equatorward of 40 degrees latitude in both hemispheres is generally warmer than normal. Most of the Atlantic and Pacific Oceans are warm at these latitudes, while the Indian Ocean is a mixed bag. If these are long-term trends, they could affect air temperature and circulation worldwide. Of particular interest is the unexpectedly weak La Niña which followed the recent powerful El Niño. California had suffered through four years of extraordinary drought; reservoirs had shrunk to 1/3 of capacity. And then came the rains of winter 2017. In much of northern California, precipitation in the first six weeks of 2017 had exceeded the normal amount for an entire year. This is generally good news, but it has a down side. Water released over spillways from the Oroville Dam forced the evacuation of 188,000 people. Photo courtesy of NOAA. 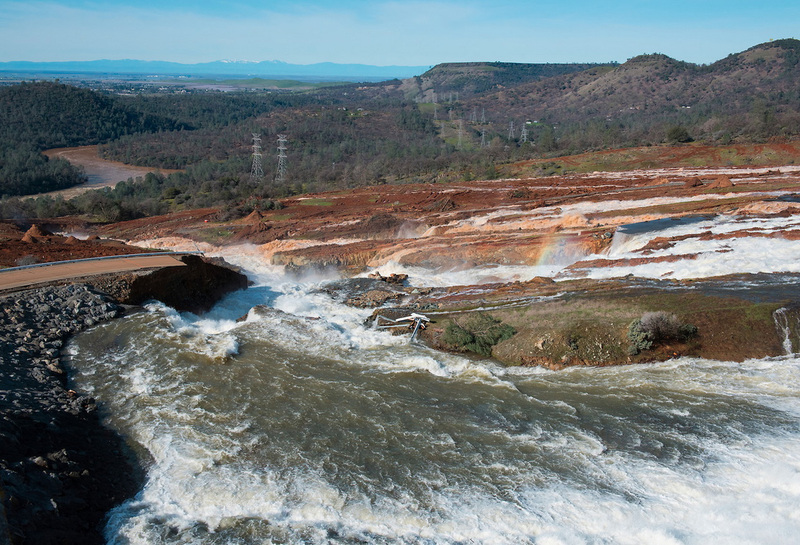 The most significant problem was the threat of collapse of spillways over the Oroville Dam when Lake Oroville had reached its limit. Engineers needed to expel water through spillways which were in disrepair, leading to evacuation of nearly 200,000 people. There are 90,000 dams in the US, 15,000 of which are considered high-hazard. They are mostly privately owned and covered by state laws; inspection is spotty and enforcement of maintenance laws even spottier. Dams are built with an expectation that the weather in the future, particularly the precipitation, will be like it has been in the past. One of the unanticipated changes that may accompany global warming is an increase in extreme precipitation events. Dams that could handle precipitation within normal bounds of wet and dry may not be able to handle the increased precipitation which is possible in the future. So is this year’s precipitation in California a 500 year event — or the new normal? As we mentioned, there is an anti-blob near Greenland, and the blob in the Gulf of Alaska has been supplanted by an anti-blob this winter. This anti-blob can be cited as the cause of the California rains, with the corollary of warmth in Denver, lack of snow in Chicago, and with a little imagination, warmth in Burlington, Vermont. The jet stream is a reflection of the temperature contrast below. So the Pacific anti-blob has strengthened the jet stream over the Pacific Ocean, leading to ocean storms which have brought the rain to the west coast. Longer range forecasts for the US for spring and summer call for the anti-blob to persist, with the accompanying jet stream moving north to give the northwest cool, damp weather and the rest of the country warmth. On February 10, 2017, the temperature at Denver International Airport reached 80° F – that’s the first time for Denver to register a mid-winter temperature in the 8os. In fact, the new temperature record surpassed the old one — first set in 1890 — by three degrees. The weather pattern that produced this summer weather in winter is relatively common in places that abut a mountain range. The ideal gas law relates the pressure on a gas to its temperature — they go up and down together. This is a slight simplification and air isn’t quite a perfect gas, but the relationship between pressure and temperature helps explain why Denver sometimes has wild temperature swings. The pressure falls with height in the atmosphere because at higher altitudes there is less air above pushing down. So when air rises, it cools (The temperature goes down as the pressure goes down). If the air is dry (unsaturated), it cools at about 5 F per thousand feet. However, if the air is saturated, some of the water vapor will condense as it rises because cold air cannot hold as much water vapor as warm air. Condensation releases heat and this process partially offsets the natural cooling of rising air. Rising saturated air cools at approximately 3 F per thousand feet. Denver is situated at about 5,000 feet above sea level on the eastern slopes of the Rocky Mountains. Sometimes a flow of mild, saturated Pacific Ocean air climbs the 12,000 foot or higher peaks, squeezing out moisture in the form of rain or snow as it does so, and descends on the east side. By the time it reaches Denver, it has cooled at 3 F on the way up and warmed at 5 F on the way down and can be as much as 20 F warmer than when it came off the Ocean. A warm wind descending a mountain is called a Chinook. The Santa Ana of southern California is the best known such wind in the US, but Chinook winds (called foehn in Europe) can occur near any mountain range. When cold, dry air plunges into the plains in winter it can climb to Denver to produce very cold temperatures. Fairly often, the temperature on the east slope of the Rockies can fluctuate tens of degrees in a short time as the air masses fight for dominance. In Spearfish, South Dakota, the temperature rose from -20° C (-4° F) to 7° C (45° F) in just two minutes. Later in the day in Spearfish, the temperature dropped from 12° C (54° F) to -20°C (-4° F) in 27 minutes. In Rapid City, South Dakota, the temperature rose from -15° C (5° F) to 12° C (54° F) in 20 minutes. On January 20, 1943, a frontal boundary was forming over the plains. Weather map courtesy of national Weather Service. The sudden changes in temperature across the freezing point of water caused windshields to ice up; the rapid, extreme temperature changes caused plate glass windows to crack. Burlington, VT Sets A February Record. Is It Part Of A New Normal? There’s an apocryphal story of the Vermont native who is told by surveyors that his house is actually just over the state line and is really in New Hampshire. “Thank goodness,” replied the old-timer in a thick New England accent, “I couldn’ta stood anothah one o’ them Vermont wintahs.” The joke wouldn’t have worked so well this year, especially on February 25. Burlington is not normally a warm place in the winter. On most days the high temperature is below freezing. But on February 25 of this year, the temperature soared to 22° C (72° F). This was not only a record for the month, it beat the old record for the date by SEVENTEEN degrees Fahrenheit. Such an event is very rare. Most models of global warming predict an increase in extreme weather events. That would be natural for high temperatures as the climate warms, more in some places than others. But the more dangerous path is for the extremes to be getting more extreme. Burlington’s 72 degrees on February 25 is just a single data point that supports this idea — but there is an increasing number, such as the record rain in California in February after a record four-year drought. And record heat in Australia. It wouldn’t be unusual if it were any other time of year. But no measurable snow in Chicago in January and February? Hard to believe. That doesn’t mean it didn’t snow; but it didn’t snow enough for an official measurement of more than half an inch. Still hard to believe. The same weather pattern that brought heavy rain to California and record high temperatures to Denver can be blamed. The jet stream that began in the Pacific Ocean in response to the anti-blob, caused storms to pass south of Chicago, while another branch of the jet stream stayed to the north. Still, hard to believe. February in Australia is like August in the northern hemisphere. It’s often hot — but not this hot, particularly in the south. Much of Australia sweltered in February, with the epicenter of hotness in the southeast. Temperatures in New South Wales (the state of which Sydney is the capital) soared as high as 47.6° C (117.7° F). The high temperatures coupled with low humidity resulted in hundreds of bush fires that made skies ash-filled over Sydney. Some authorities were comparing the situation to ‘Black Saturday,’ Feb. 7, 2009, when over 100 people died in fires, but no fatalities were confirmed this year. At 2 a.m. on Feb. 7, the eye of Cyclone Enawo was crossing the coastline of Madagascar with maximum winds over 140 miles per hour. Graphic courtesy of US Navy. March is the height of the tropical cyclone season in the southern hemisphere. Though the southern seas do not, for a variety of reasons, produce as many or as powerful tropical cyclones as those in the northern hemisphere, the season is not normally as quiet as it was this February. But the strongest storm of the season, Enawo, popped up last week in the Indian Ocean, and is currently coming ashore in Madagascar with category four hurricane force winds up to 144 miles per hour. Widespread damage is expected and loss of life is a possibility. Spring arrived by meteorological standards on March 1 and will start by astronomical measures on March 20, the equinox. Decoded Science has pointed out that the end of winter should be defined as the end of the coldest 91-day period, which falls about half way between the dates of the two most popular definitions. Whatever definition you use, spring will be in full swing by the time the next Weather Around The World is published on April 4. Meanwhile, if significant weather occurs where you are, leave us a comment.